And funfetti as it indeed was, I had mixed results with this recipe. The flavor was really good, thanks to almond extract (in both the cake and the frosting) and I made a mental note to use it more in the future. The frosting was divine. And sprinkles just bring it. But when I pulled the three layers out of the oven none of them seemed to have risen enough (despite the egg whites) and one layer was downright lumpy and uneven and at first I wasn’t sure why. It was only when I searched for the recipe online in order to share with you, hungry readers, that I found a clue. A slightly different version of the recipe appears here, and in this iteration she calls for cake flour, while the book uses regular flour plus cornstarch (which, as Molly correctly points out, is essentially cake flour). However, the link she provides for making your own cake flour (which no longer works but here it is) has a different ratio than what is in the recipe in the book. That’s all I can come up with as to why mine was a qualified failure. But what are you going to do at this point? You assemble the layers, pairing the convex with the concave, smother it with frosting and soldier on. That’s what you do. The cake was in honor of a workplace milestone and fortunately my co-workers know that when I say “what do you think?” I want candor. The consensus: great flavor, great frosting, but the cake itself was simultaneously dense and a little dry (you can see this a little in my picture). If I were to make it again (and I’m sorely tempted to), in addition to the cake flour fix, I would mix the batter a little longer and at a higher speed to incorporate more air and give the egg whites a chance to develop structure. One other fix: as written the frosting will just barely cover the cake; if you want the perfect covering shown in Molly’s pics you will need more. And if you’re looking for a really smooth finish here’s a tip: hold a bench scraper perpendicular to the side of your cake and run evenly around the whole 360 degrees. If that doesn’t work, cover the sides with toasted sliced almonds. But. 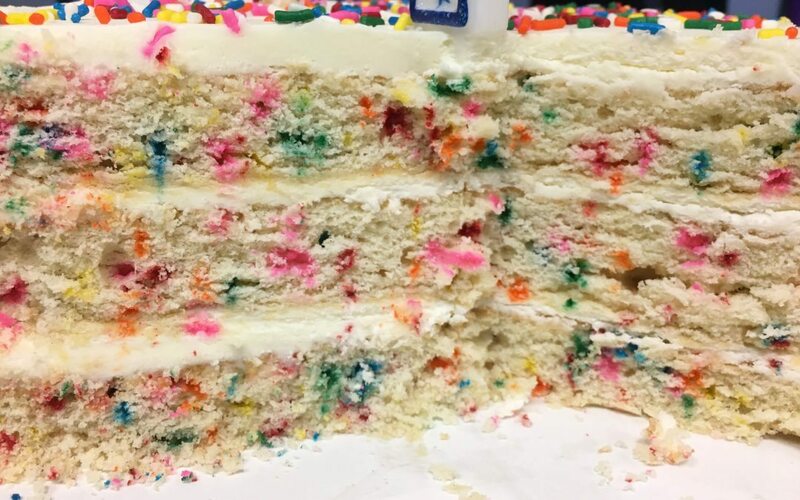 Is a Funfetti Cake really about perfection? Who are you trying to impress, 8-year-olds? (Because if you are you have way over-estimated the effort required; you could have given them each a tub of sprinkles and a spoon and called it a day.) No, it’s about fun. It’s about slicing into an ordinary looking cake and finding a party inside.